Before the late summer heat hits, it’s worth giving a good long do-it-yourself look at that vitally important indoor air conditioning and ventilation system – including every component from the evaporator, blower and air handler to the ducts, wall intake, drainage hoses and floor registers. Heed the advice of your local friendly HVAC experts from One Hour Heating and Air. 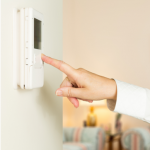 Treat your home’s air conditioner or heat pump unit to some extra careful attention and it should treat you to total in-home comfort the rest of this summer. Keep the path of airflow in your home’s ductwork clean and filtered. 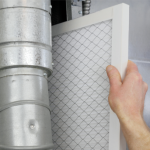 It’s a smart year-round homeowner tip to replace(or clean, if it’s the reusable kind) the HVAC filter every couple months -and even more often after the pollen filled days of spring. Thisis a sure way to remove any dirt, fur, soot, and allergy-causing particles floating around the air you breathe. Just slide in a new clean air filter. Also, give a visual inspection to your A/C’s air intake vent, usually placed on a wall. Remove dust, cobwebs and debris so it takes in plenty of clean air. Make sure your condensate pan and drainage line is clear. This is also a great tip you can use all year. Water from your inside evaporator coil can allow algae and mold to grow, eventually clogging the drain. The result is nasty odors, possible water damage and uncomfortably humid air in your home. 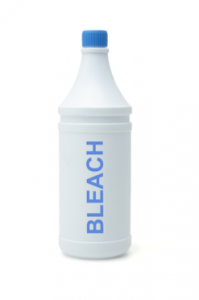 Step 1: About once a month, mix a cup of distilled vinegar or bleach liquid(not the gel, and nothing with harsh chemicals!) into 20 ounces of hot water. Listen for any unusual sounds or noises. Whirs, pings, thumps and bangs could indicate th at your air comfort system’s motors and moving parts are wearing out, such as the fan, compressor or pump. 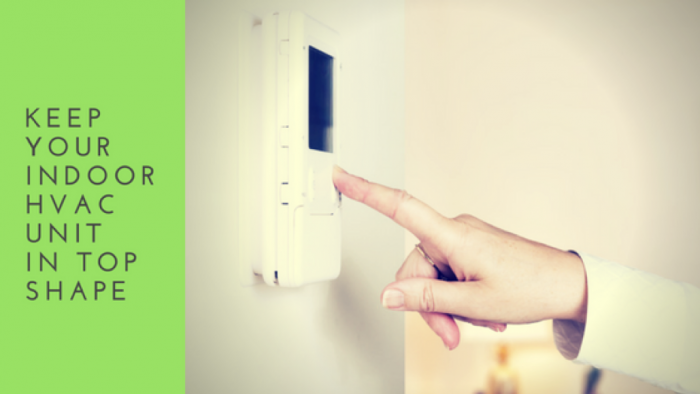 Experiment with your thermostat by raising and lowering the desired temperature, and by switching the fan from “Auto” to “On” and back. Make sure the fan kicks on and turns off when it should, and make sure that when you set the temp. lower than the outside temp., plenty of cool air is blasting out of all your home’s register vents. As your HVAC system performs this test, listen closely – you might hear your home’s central air conditioning equipment trying to tell you something. Take a tour of your home or office. The amount of air being blown through each floor register should be the same throughout the entire house. If anything is amiss with your internal A/C unit – or if you just need total peace of mind – give us a call at 571-421-1888. When homeowners thing about their home’s air conditioning, heating and ventilation systems, they often think first about that huge block sitting out in the backyard(the condenser coil). But when you need to know your family will be cool and comfortable at home the rest of this summer, it’s also what’s on the inside that counts. 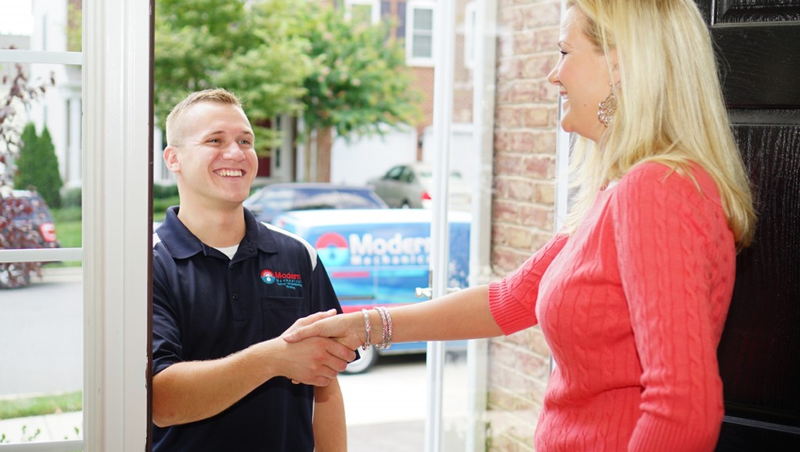 About One Hour Heating & Air Conditioning: Serving Loudoun, Fairfax, Northern Virginia and the entire Washington D.C. region, with prompt, punctual, friendly, technically superior home services since 2009, including HVAC repair and replacement, diagnosis and parts, and indoor air quality analysis. 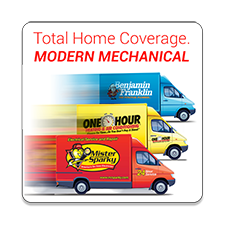 Call One Hour Heating & Air Conditioning today at 571-421-1888 or make an appointment online here. Please stay connected with One Hour Heating & Air Conditioning on our Facebook page at @modernmec to keep up with how you can help us continue to help our community and our world.